He broke on through to the other side! He's a rider on the storms of the netherworld! So I guess it wasn't the end, my friend! Father, I want to kill you. Mother, ummm, can you take my picture? 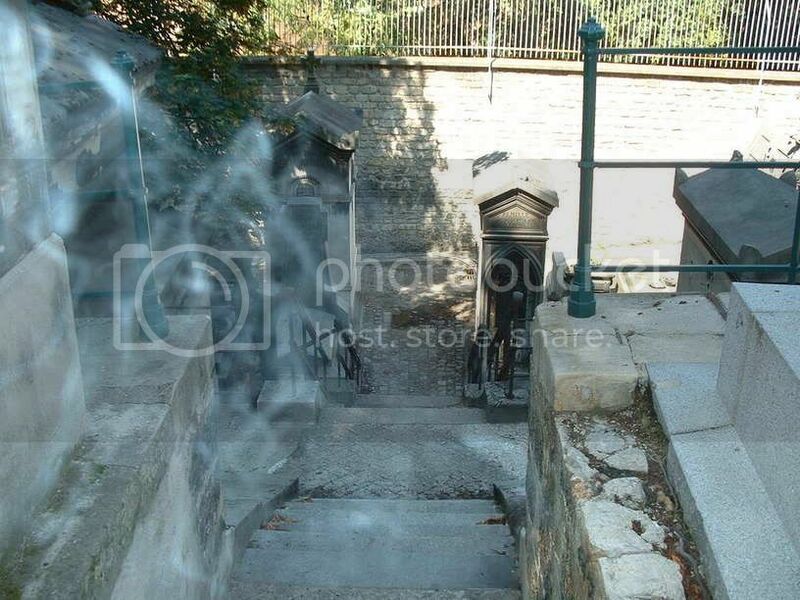 *Chuckle* My dad accidentally made a 'ghost' picture on that very same cemetary (Père La Chaise) a couple of years ago. Smoking whilst making a picture gives nice effects! As for the picture...not very convincing to me. WHEEE!!! "Dead Famous: Ghostly Encounters"! My 13 year old and I LOVE that show! She thinks they're absolutely real. I think Chris is a very good actor. hehe -- elminating a double post. geez. First it starts with two pictures of Morrison, whoever he is, then some sort of album cover, or something, on the table has a picture of him. 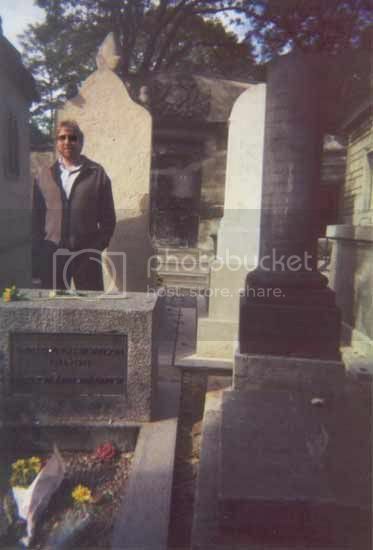 If you don't see him in the graveyard photo, it only means you're not very suggestible. Gah...please tell me you're kidding about "whoever he is"? Am I really THAT old? A very famous American alternate news radio host, Art Bell says this song paralleled O.B.L. in 2001. During the first Gulf War in 1990 and 1991 I always thought it paralleled S.H. We gave that man a ride. We gave both a ride. The 1st Gulf War was named Operation Desert Storm, and if millions thought this song was connected it's never discussed in alternate news. Snopes takes interest in a topic called Hidden Messages in Music. I think they are looking for messages hidden on purpose. Not by coincidental synchronisity. "Riders On The Storm" from 1971 by The Doors' album L.A. Woman. An actor out on loan * S.H. 's doubles? Most lyrics sites say, "alone" so listen very closely. There’s a killer on the road * Improvised Explosive Devices? Car bombs? His brain is squirmin’ like a toad * A perfect description of a terrorist's brain. Take a long holiday * American citizens. If ya give this man a ride * S.H. Killer on the road, yeah * I. E. D.s? mentioned a 2nd time. Girl ya gotta love your man * A soldier's wife or girlfriend. An actor out alone *S.H. was alone when caught! A dictator is a bad actor that too many believe. I hear this song nearly every night on the road listening to Classic Rock radio. I used initials for the Islamic jihadist's names. ECHELON is reading the important names we print out. PS Is Jim Morrison a cowboy in Montana? That story has been on alternate news a little last year, but not this song with the "killer on the road." Although this should be posted in a stupid stuff you've done thread until I clicked on that link I thought Jim Morrison was black. I just had to share cause I'm never telling anyone IRL... ever. Oh, jeez... Kids these days. Oh yeah, and Jim Morrison the cowpoke. We discussed both these topics here, but the ghost photo link no longer works. It looks like a guy jumping off the steps, maybe even skateboarding. :\ Its suspicious that the guy is off-center, but the 'ghost' is dead on. No, I'm not kidding. You're only 10 years older than me, so I wouldn't say you were that old. Calm down and take some Geritol, Grandpa. I guess not...maybe it's just that I listened to bands like the Doors, Jimi Hendrix, Uriah Heep and Black Sabbath, etc, during my high school years(and in the present in fact)...but...10 years CAN make a difference. The Doors were an excellent band, please try to listen to them and see what you think. I didn't know there were people who didn't know who Jim Morrison was, at least in an offhand way. I can see not having listened to the Doors, but there are so many pictures of him everywhere. There are even shirts with his picture now. ETA: I'm not mocking anyone who doesn't know who he is, I'm genuinly surprised. And AFA age goes, I'm only 20. Me: "He's 19? Uh oh, I bought him a beer." A: "You contributed to the deliquency of a minor in drag!" Am I a freak,or would the Doors have been way better without Morrison? No,wait,I'm a freak. You'd think so, but the proof that they wouldn't be is the 2 (oh yes) albums they did without him after his death. I shall baffle you with cabbages and rhinoceroses in the kitchen and incessant quotations from "Now We Are Six" through the mouthpiece of Lord Snooty's giant poisoned electric head. So there! Good Point. No, GREAT point. I sit corrected. He's not dead. He's running a dental practice in Coulsdon, Surrey. I am not taking lectures on physics from a man in tights. With Elvis as his hygienist? No, really. There's a dentist in Coulsdon called Jim Morrison. If you exit the M23 and keep follow the road, going past Renault Couldson, you'll see the sign on the left side of the road! I keep meaning to take a picture of it so I can display it on here, but I'm usually asleep when we drive by it. Obviously I'm not driving. Go on. Rent The Doors. Sure the facts get screwed up in the movie, but it's like a drug trip just watching it.